The Humane Society of the United States estimates that the average American pet dog needs seven times the amount of exercise that (s)he currently receives! 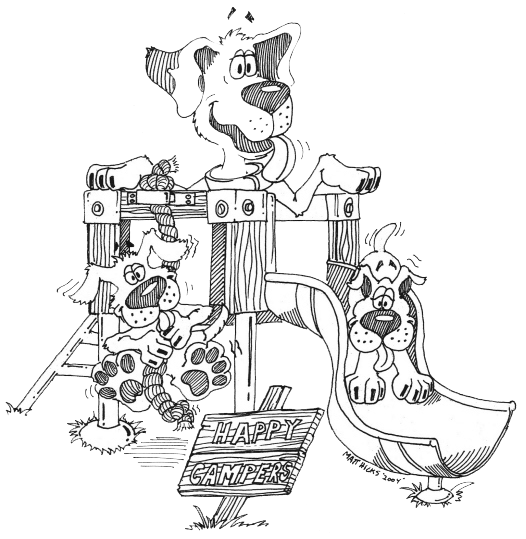 CAPE-ABLE CANINES HAPPY CAMPERS DOGGY DAY CARE gives your dog the companionship and exercise he needs! Our day care employees are caring and experienced dog handlers with training in understanding dog body-language and canine play styles. Your dog will be supervised at all times! So, what is daycare like? During the day, it’s all about play! Toys are available in play-groups with dogs that can share. Although sunbathing is an option, wading pools, misting fans and shade tents keep everyone cool. All dogs have a snack-and-a-nap at noon and always have access to fresh water, whether resting or at play. We are not a drop in day care. In order to ensure your dog’s safety and happiness, we require a commitment to at least one day of daycare a week, for a period of four consecutive weeks. We will evaluate your dog on their first day of day care, and put your dog with other dogs with a similar temperament and play style. We have a vet on call in case of an emergency. Customized PRIVATE TRAINING SESSIONS can be provided (at additional cost) as an overlap to daycare. However, all dogs enrolled in our daycare learn good social skills, practice basic obedience commands and get plenty of exercise. As a result, your dog’s behavior at home will improve! Are you concerned about how to "Crate Train" your puppy while you are at work? Ask about our PUPPY POTTY TRAINING SERVICE (extra fee)! Dogs under 6 months of age should not be integrated with older, more assertive dogs. We happily provide PUPPY PLAY which ensures that your puppy receives appropriate exercise and is safely socialized to many new experiences! *In order to enroll your puppy in PUPPY POTTY TRAINING OR PUPPY PLAY, you must follow your vet’s schedule of vaccines carefully. Spay/neutering must occur before they are 6 months of age in order for your puppy to merge into regular daycare. We provide an additional Service that we fondly refer to as our MASH UNIT. We can provide rest, supervision or vet-approved exercise for dogs that are post-surgery or with special needs – whether your dog is elderly, has a physical disability or another health concern, we will work with you to meet your dog’s particular needs.